In May 2015 I had the absolute privilege to travel to Japan for one half of my 2015 Winston Churchill Fellowship. During my three week visit I stayed connected with family, friends and colleagues by posting seven blogs on my travel blog site www.dementiakeepingconnected.wordpress.com. I am delighted to share with you in this week’s blog my final blog post from Japan that I posted on the 30th May, reflecting on my visit. I am sitting by the river in Kyoto. It’s my last day before travelling to Narita for the flight home. As I sit in the shade of 34 degree heat and watch the ducks splashing around, I am grateful for this time out to reflect on my time in Japan. I didn’t realise it was possible to feel so exhausted and inspired at the same time! During my 3 weeks here I have visited 9 day centres and group homes and met over 100 people with dementia, their family carers, health and social care staff, policy makers, researchers and businesses. I have had meetings with professors at the cutting edge of dementia care, met with organisations including Alzheimer Association Japan, Ministry of Health for Japan and three local health ministry departments in Uji, Sendai and Setagaya, Dementia Care and Research Centre, Dementia Friendly Community Network Japan, Tokyo Metropolitan Institute of Medical Science, Shinko-Fukushima-Kai Social Welfare Corporation and NHK (Japan’s equivalent of the BBC). I have been in two earthquakes, one typhoon and was unable to visit Hakone due to volcano eruption warnings. I have been welcomed by the Mayor of Uji City, been supported by the British Embassy and many translators and met amazing colleagues, now dear friends, who have helped me with my itinerary, travel arrangements and local traditions (and after 3 weeks I have finally mastered how to use chop sticks!). I have learned about the new Orange Plan (Japan’s dementia strategy) and how this is being developed together with people with dementia and carers. I have heard about its focus on supporting people with dementia to stay connected to their communities, ambitions which also shared by Scotland’s dementia strategy. I have been able to hear and share opportunities and challenges in timely diagnosis, post diagnostic support, care co-ordination and end of life care. I have heard about dementia supporters in Japan (a programme which inspired our dementia friends in the UK). 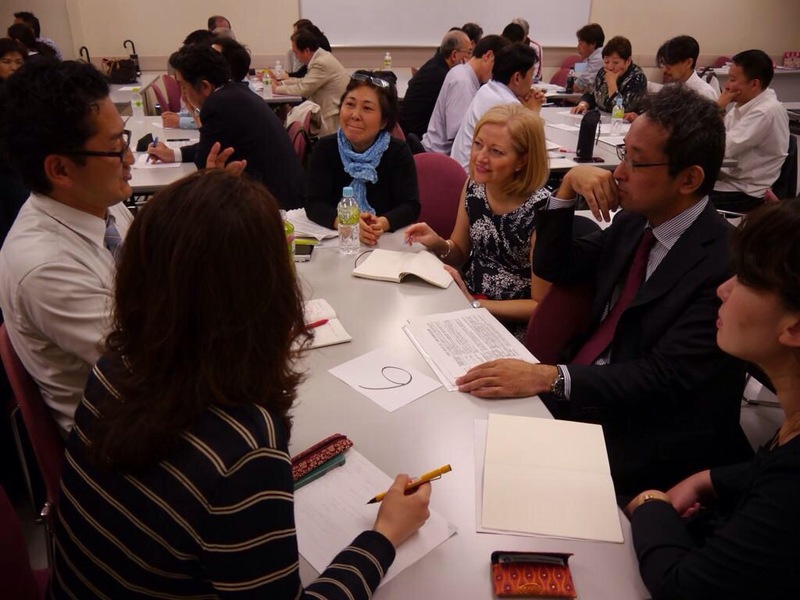 I have had the privilege of attending the ‘Ofuku meeting’ where leaders in dementia came together from across Japan for an evening discussion on dementia priorities. I have met such welcoming and respectful people who have shown compassion and a determination for improving the experience of people with dementia and their carers. They come from all different backgrounds with a shared vision for change and, despite their great work, they remain so humble. In a culture of compliance with rules, I have seen great examples of flexibility and responsiveness, with a real focus on supporting what matters to the person rather than fitting with the system or service available. I have witnessed how people are valued and supported to continue to do meaningful activities and of the benefits of maintaining self esteem and remaining connected to their community. The BLG day centre (featured in my ‘Men at Work’ blog) is a great example where staff have fostered win-win relationships with businesses to enable people with dementia to continue to be supported to work and contribute to their local community. 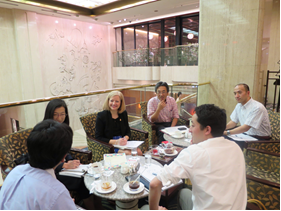 Meeting the Dementia Friendly Communities Japan Network was another great opportunity to hear how businesses are working together to design and test solutions for people with dementia, enabling them to remain connected to their communities. I have visited a day centre in a traditional family home where people with dementia and young children all attend together. I have watched the faces of people from all generations light up as they sit in each other’s company. I have seen people in day centres supported to do the things they want to do without fear, like baking pancakes on a hot griddle, preparing vegetables for the potato salad and cutting open packets with scissors (featured in my ‘No Ordinary House blog’). I have seen staff and people with dementia sitting around the same table enjoying the same food and chatting about every day things, just like a dinner with friends or family (see more in my ‘Ladies who Lunch’ blog). I have seen great examples of how health and social care are working together to ensure responsive and safe care. 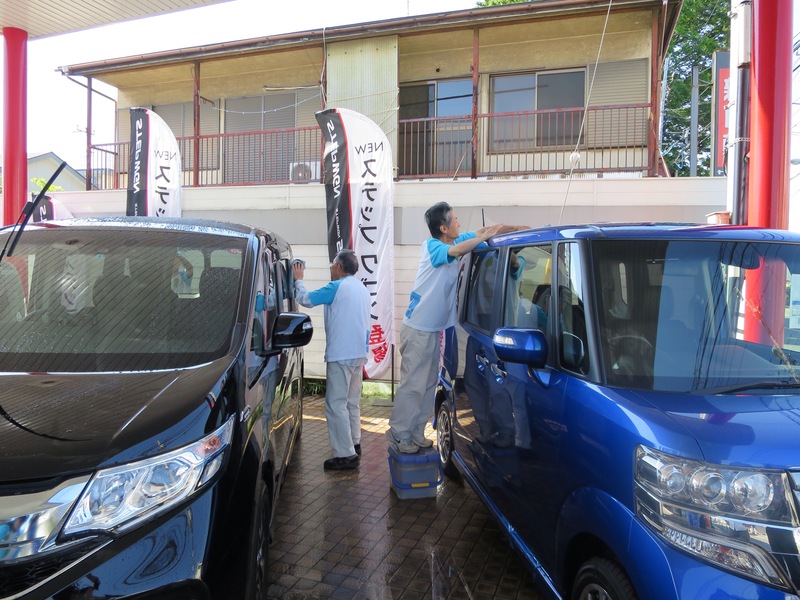 For example within Shinko-Fukushima-Kai Social Welfare Corporation staff from many sectors are all working together as one team to meet the needs of people in day care, short term respite and long term care. I have visited Uji City – a city with an amazing vision and staff, people with dementia, carers and communities working together to make this vision a reality. I have experienced group homes in action, for me an excellent option for people no longer able to stay in their own homes (read more in my ‘After the Tsunami’ and ‘Making Me Feel at Home’ blogs). I have witnessed how people are supported to live their lives in a way which enables them to continue to do what matters to them and importantly to remain connected to their communities, like going to the local shops, gardening, visiting the park for a picnic and out for tea. I have met people with such resilience who have experienced the devastation of the 2011 earthquake and tsunami and yet display such positivity. People in their 90s and 100s who are so fresh faced and with wonderful smiles who have welcomed me with open arms, held my hand and made my heart melt. I have been welcomed by Robert Burns’ songs sung in Japanese and hand painted Scottish flags. I have been introduced to the ‘orange’ and ‘lemon’ cafes, providing opportunities for the community to come together to provide peer support, to seek advice and to build friendships. I experienced people with dementia bonded by friendship not by a diagnosis and people living well with dementia. 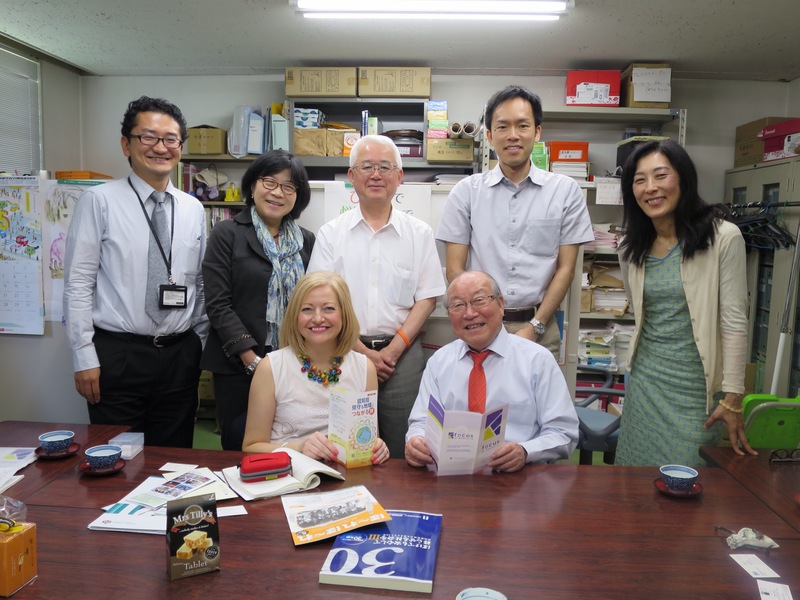 I have heard how people with dementia are raising their voices to be heard through conferences, strategy meetings and through the support of Alzheimer Association Japan and the media. I had an inspiring meeting with Alzheimer Association Japan and a fascinating day at NHK hearing more about this journey. Despite my busy schedule I have had the opportunity to experience some of the delights of Japan – world heritage sites, the most amazing temples, castles and shrines. I have seen weddings in the park with beautiful brides in traditional kimonos, watched a carnival where people of all ages danced together through the streets of Tokyo. 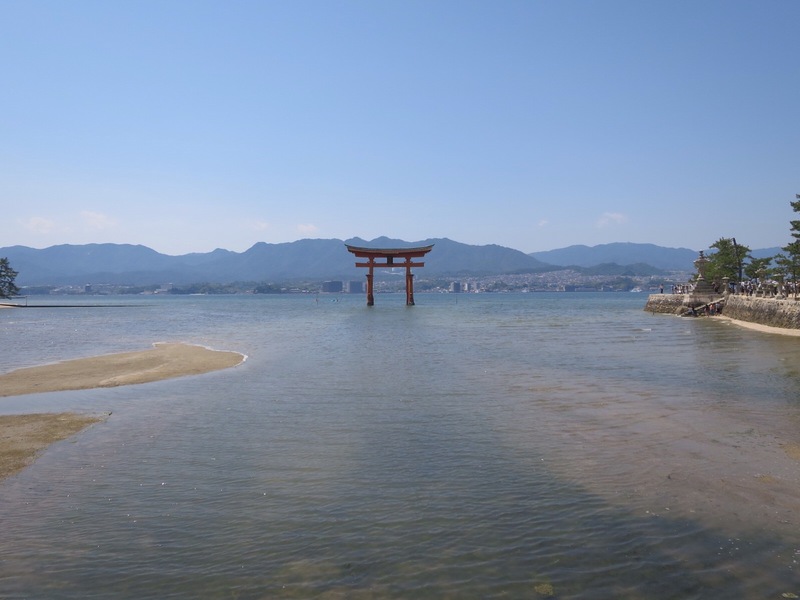 I visited Hiroshima – a moving day taking in the atomic bomb site of August 1945, peace park and museum and I have cycled around beautiful Kyoto – the best way to find the hidden treasures of ancient Japan, nestled at the edge of the countryside and bamboo forests. I have visited the food markets and sampled local delicacies including sweet fish, eel, jelly fish, green tea ice cream and of course sake! I have seen pandas and have managed to be chased by four monkeys in the monkey sanctuary, who wouldn’t let a group of us leave the park, and the next day chased by two deer who were attracted to my ice cream and map. All of these experiences, some of which I have captured through my previous blogs, have left me feeling so inspired and as I leave the cool shade of the river bank and make my way through the winding streets of Kyoto, I feel truly privileged to have had this amazing opportunity. I have learned so much and I look forward to meeting with colleagues to share more on my return home. Thank you to the Winston Churchill Memorial Trust for this amazing opportunity. I have such treasured memories and so much more to reflect on as I make my way home. 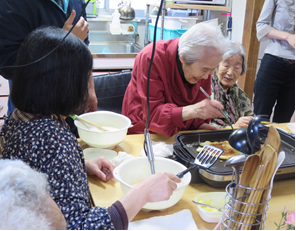 What do you think the similarities and differences are between dementia practice in Japan and Scotland? Is there any learning we can take from Japan to inform our practice in Scotland? At the end of September I travel to Boston, Washington and San Francisco. I look forward to sharing my reflections and learning from this visit on my travel blog at www.dementiakeepingconnected.wordpress.com. 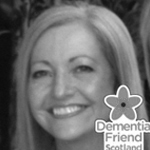 Michelle is the National Improvement Advisor for Focus on Dementia programme at QuEST at Scottish Government. Michelle works in partnership with key agencies including Joint Improvement Team and Alzheimer Scotland and health and social care practitioners, to provide an improvement infrastructure to support developments in post diagnostic support and testing the 8 pillar model of community support for people with dementia, their carers and families. 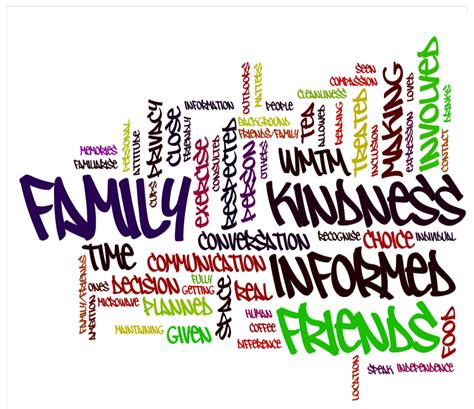 Family, kindness, Informed and friends, these are just some of the main things that matter to Queen Margaret University students when it comes to thinking about how they would like care to be delivered to them. And its been one of the key focuses of an on line module that we have been piloting entitled “Living Well with Dementia”. Its been a fast paced and exciting 8 weeks, and the learning from and with the students has been immense, and something I am very proud to have been a part of. We have tweeted, video conferenced, discussed, tweet-chatted and reflected our way through a range of topics and questions, from early diagnosis and care to the use of technology and doll therapy. All of which is aimed at enhancing our learning about how we will deliver person centred care to those with dementia and their families, that we will care for in our professions. Why do we need a dementia module, surely its covered in teaching? You might be asking this, that sounds great but why is it required? Sadly the majority of training in the UK in Dementia is delivered after students have graduated! But we don’t see individuals with Dementia after we have graduated, we meet them and their families when we are still students, and I know from personal experience how scary it can be to meet someone who is distressed and challenging to staff, and how it feels to be that helpless individual. But what if we could educate our students in delivering good dementia care? Wouldn’t that be great for them and the people they will work with? Wouldn’t it be great to be able to sooth that troubled individual? After all it might be a member of my family or me one day. Dementia really is everybody’s business. Too often in my working life I have met families with loved ones who are “denied access” to care due to either the professional’s lack of knowledge in dementia, or the clinical guidelines that say “the patient must have no cognitive impairment”, and it has made me feel quite ashamed in the past and powerless. To have a cognitive impairment seems to be an insurmountable hurdle for many when it comes to delivering care and too often health professionals are stuck in what we call a “biomedical model of care”. Don’t get me wrong there are many miracles in modern medicine and we should be proud to be part of that culture. But the price we often pay is losing sight of the person and what matters to them. In my clinical work I loved getting to know my patients and their life stories, it was the knowledge of the detail that helped tailor make that care and made it the best it could be. One of the biggest reflections in the module was when we discussed the “What matters to me” campaign #WMTM, and what you see in the wordle above are our own views. Not really that different from what anybody wants I imagine. We finished the module on the 8th of April with 8 students who stayed the course and who I hope will be our future ambassadors in Dementia care. I feel assured that the future is in safe hands, we are committed here at Queen Margaret University to ensuring that our students have that opportunity to learn about dementia and I am looking forward to the next phase of the journey. 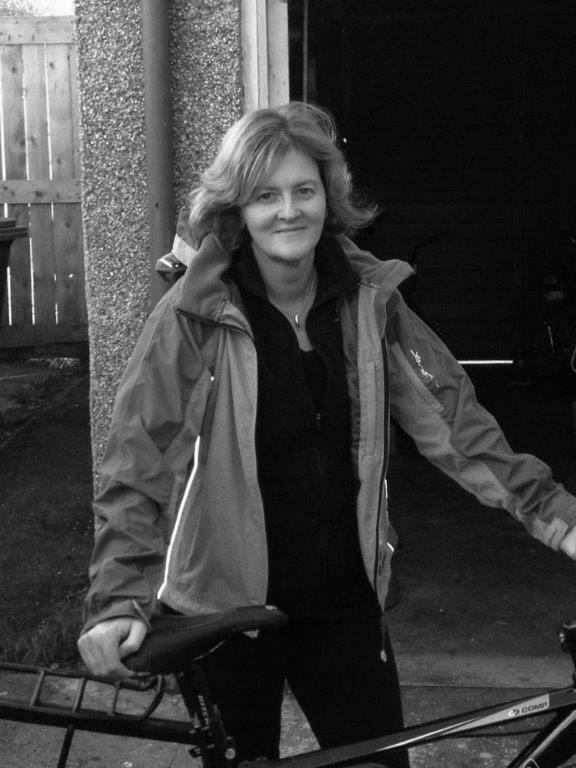 I am a physiotherapist to trade and am currently lecturing at Queen Margaret University in the Physiotherapy team . With a background in Neurology and Cardiorespiratory Physiotherapy I am passionate about those in our society who are often excluded because they are “Misunderstood” or don’t quite fit into that medical box.